In the cultural heritage field, many Serious Games applications have been developed whose goal is to educate players and users not particularly specialized or familiar with this field. On the other hand, 3D models of cultural heritage objects created with precise 3D modelling methods can be a very useful asset for these applications. In this paper a composite Serious Game for the Stoa of Attalos, a prominent monument in the Ancient Athens Agora, is developed and presented. 3D models are used, which were produced mainly with automated image based modelling techniques. The creation of the 3D models is described and presented along with the development of the application, which offers three options for the player. These options are: a quiz game, a 3D visual quiz and a virtual museum. The user interaction is described and, based on an evaluation questionnaire, the application is assessed by a group of people in the Cultural Heritage field. Nowadays, there are techniques available to create realistic 3D models of practically any object, among which are also cultural heritage assets. These 3D models can actually represent reality in extremely vivid ways. This can be very useful in many virtual reality applications. Realistic textured 3D models can be created using different methods. When based on 3D digitization, these methods may include laser scanning, digital imaging or a combination. In the cultural heritage domain, a 3D model can represent a whole building but also smaller objects, such as exhibits in museums, decorative elements, etc. They are very important media in serious games applications for cultural heritage, because they can help people that are not specialized in this scientific domain, such as tourists, school children, college students, museum visitors and others, to gain experience, expand their knowledge and stimulate their interest. 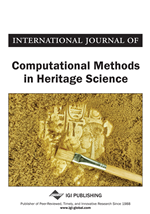 The basic goal of this paper is to demonstrate and evaluate the usage of realistic 3D models created with 3D reconstruction techniques (mainly image-based) in a serious game developed for the Stoa of Attalos monument, in Athens Greece. The rest of the paper is organized as follows: in the next section an overview of the most important implementations of serious games in the cultural heritage domain is presented; then some basic thoughts concerning geomatics and 3D modelling are presented; in section 5 the creation of the 3D models of the objects used for the development of the “Discovering the Stoa of Attalos” application is presented and explained; next the development of the application is described in detail, highlighting the various decisions taken; furthermore, the evaluation of the application is presented, and finally, some concluding remarks and the future perspectives of the project are introduced.